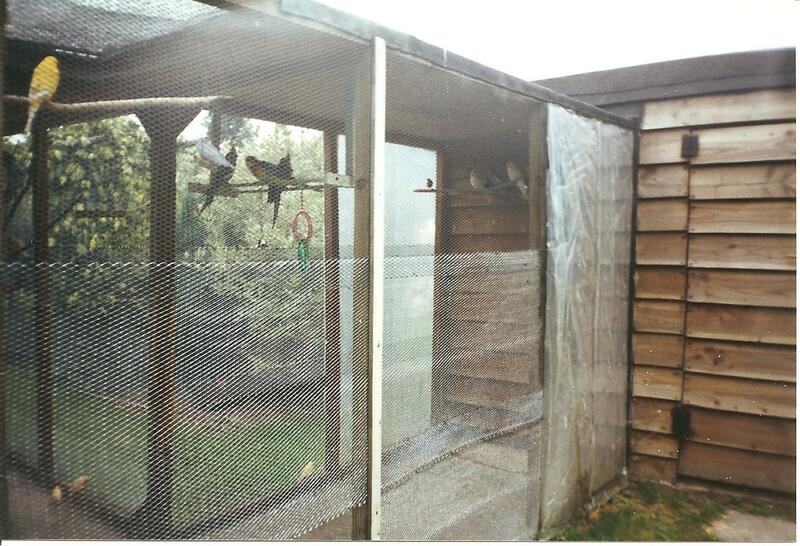 My partner John and I have always been interested in birds, so much so that we decided we would like an aviary in the garden,this was before we moved to Crete. First a plan had to be drawn up to a suitable size so as not to take up too much room in the garden as there were many shrubs and trees we did not want to lose. John had previously been a member of the Cage and Aviary club and had also bred small birds such as zebra finches,budgies, the green singing finch and canaries, but now he wanted to breed the more exotic species like cockatiels,love birds and cockatoos. 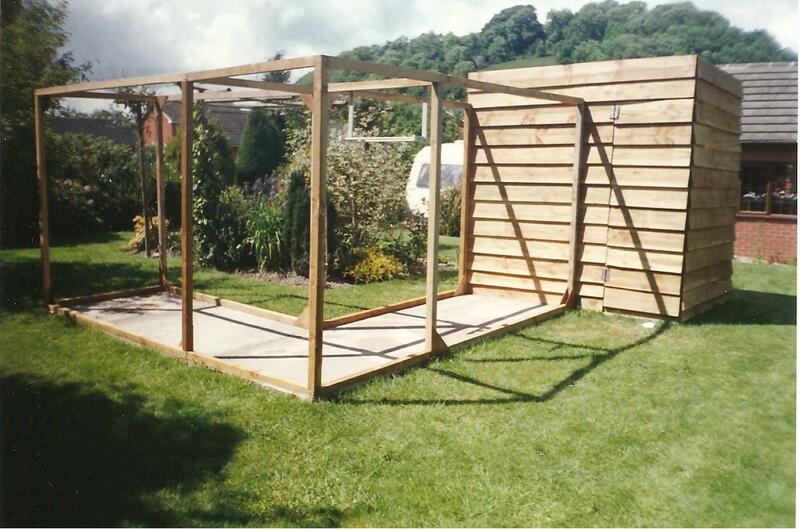 That weekend John began measuring and planning the aviary so that it would blend nicely in the garden, also that the birds would have shade from the trees in the summer months.It took two weekends to erect the main frame followed by adding wire mesh around and dividing sections for the different breed of bird. Once the aviary was complete we could then visit some pet shops to choose our first birds to breed from,this was difficult because there were so many beautiful birds to choose from but my favourites are the cockatiels. To begin with we decided to buy male and female cockatiels also male and female canaries, two pairs of each. 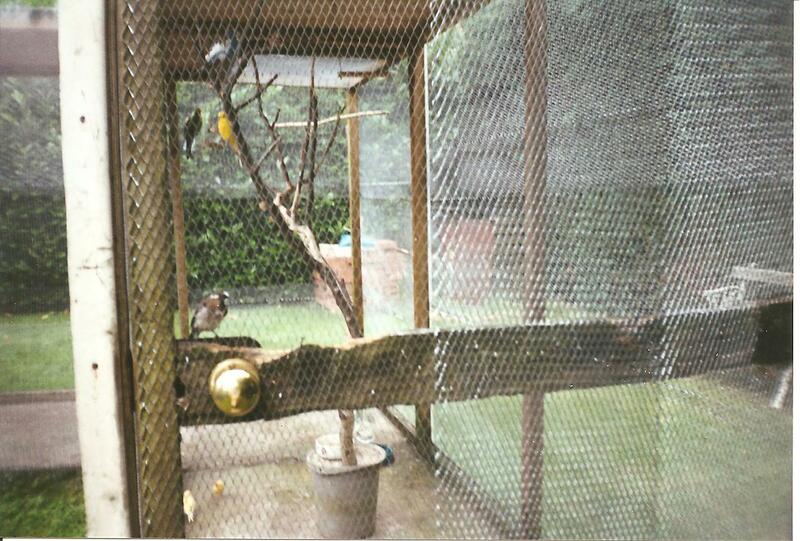 When we arrived home John immediately placed the canaries in the aviary and in a seperate area from the cockatiels just in case they did not get on with each other. As time went on we added more and more birds of different species and began breeding from them,this became a very rewarding hobby, but could also be upsetting if any of them were ill or accidentely hurt itself in some way. Our neighbors were delighted when the canaries were singing but not so much when the parakeets and cockatiels made too much noise while flying around, they loved the free space. Eventually John had the different species of his birds mixed together in the flight and they were quite happy with each other, also well behaved I might add, no fighting bullying or pecking. Once John began breeding from his birds people were asking if he was going to sell them,this he had not thought of because it began as a hobby,however we both decided it may be a good idea because the money would help pay for the upkeep of them, also when some were sold we could replace them with other birds. Its amazing how comical some of these birds can be I remember, we had for some time one of the cockatiels in the house and everytime the telephone rang the cockatiel imitated it,also if there was anything on the television where a telephone was ringing this bird would make exactly the same noise it was so perfect.Eventually this got us down and we put him into the aviary with the other birds. One day there was a meeting in the car park near to where we lived, by members of staff from the County Council when just as they began their talk this cockatiel, who we had named ringer by the way, began his imitation of the telephone.Have you ever seen six men dive in their pockets for their mobile phone. That was hilareous. Whatever bird I have kept in the house I have always let them out of the cage,obviously with all windows closed and main front and back doors. One of my cockatiels used to sit on my shoulder when I was ironing so as soon as he saw me get out the ironing board he knew that he could come out of his cage,trouble was he used to hook my earings out from my ears and fly around the room with one.He always came back when I called him,his name was Smoky. Now, Sammy was another cockatiel given to us because the person could not cope with him,they were out at work all day so obviously when they came home poor Sammy wanted some T.L.C so to gain attention he just squawked and screeched which didn’t go down very well with these people. No wonder because he had never been let out of his cage either. John said he would put him in his avairy but I said no I will have him and train him to come out of his cage. One thing Sammy could do that someone had taught him was whistle to the tune of Colonal Bogey, but he began this backward before he could whistle it from the beginning. He was very comical.sometimes he would knock on the bottom of his cage and when I looked he would duck very low so that I couldn’t see him.in other words he was playing peek a boo.However it took me nine months before I got him out of his cage and then began training him to come to me when I called, and stay when I told him,he also liked sitting on my shoulder when I was ironing. I felt happy because he now was a happy bird. Unfortunately he died some time ago.He was my favourite. Sammy playing peek a boo. When we came to Crete to live, the first thing I did was buy a bird which was a budgerigar and because I had time on my hands while waiting for our new home to be renovated I thought I would try and teach him to talk this takes an awful lot of patience as I had to keep saying the same word over and over again.Once my bird could repeat that word I went on to the next and so on. After almost one year I did succeed in teaching my budgie Joey to say several things. Our Greek friends could not believe their ears as they had never heard of pet birds talking before. When John and I went out Joey our budgie would say….where you going followed by……..going shopping…followed by………….O.K. give us a kiss then. 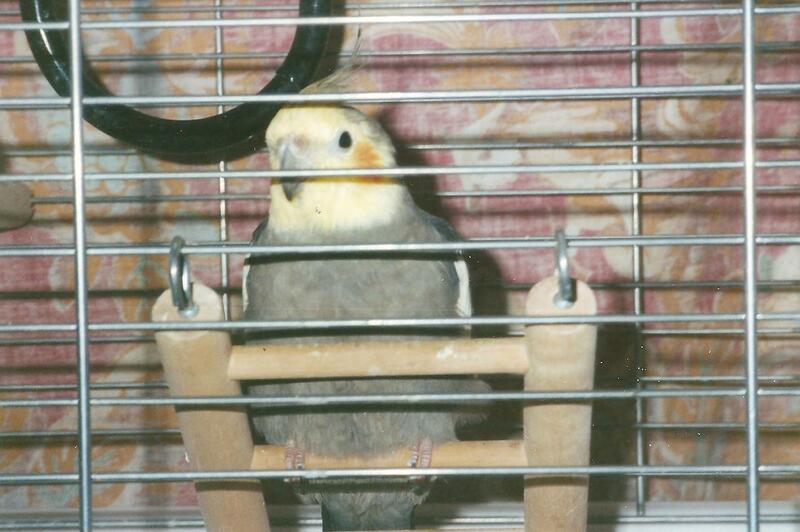 Sadly Joey is not with us any more he died at the usual age for a budgerigar age seven. So we have no birds now only our memories of them,which are happy ones. Loved the story about your pet birds, Rita. People who are unfamiliar with birds, under-estimate their intelligence, I believe. 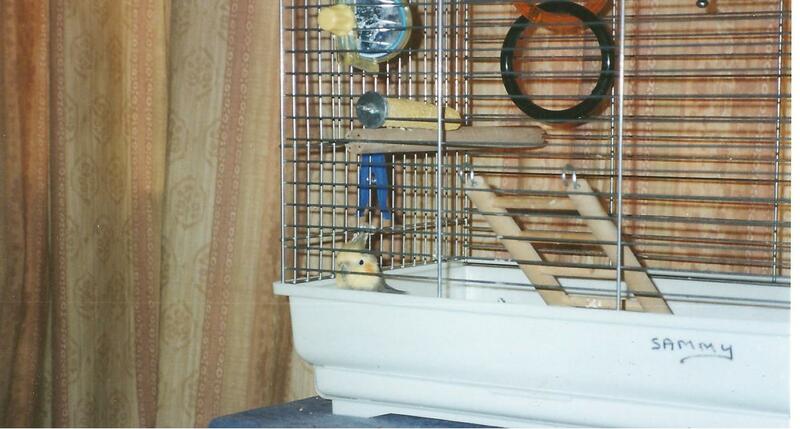 We had a pet budgie & he used to call out “who is it” whenever anyone knocked on the door. We even had a pet sparrow we found as a tiny chick on the ground-he’d fallen out of the nest. Pleased you liked my Birds of a Feather story Anne.I was getting tempted while writing that to go get another Cockatiel. That was a lovely roomy and light aviary! I enjoyed your stories about Sammy and his Colonel Bogey, and your other pets, too. Did anyone ever have a budgie that wasn’t called Joey? 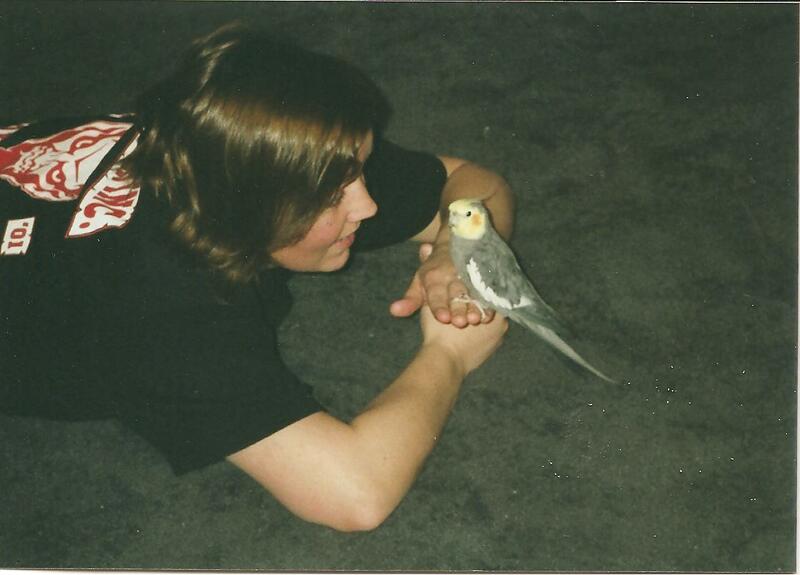 We had a succession of budgies, all called Joey, when I was a child, and now find my husband did, too. resist looking at the birds in there,I was so tempted,but as John said when we go away there is no one to look after it.John loved his Aviary but there are too many cats around,also its far too hot in the summer months. By the way all my friends love reading your posts. I will never forget Jamie, who would say “Where’s John?” and “Give us a kiss!” He was fab. Like you are! Awe ! thanks for nice compliment Etienne. Sadly we have no Jamie now but I had a Cockatiel bird just before we had Koko so they are used to each other now.